Yellow Banana chips are the true traditional Kerala item, and we are sufficiently experienced to preserve it's natural flavors. We fry banana chips in pure coconut oil and light salty sprinkle make it yummy. Tapioca chips, a kerala specialty made from thin slices of fresh. Each bite is to a healthy lightness for anytime fun. Great to eat on their own and even with toppings. 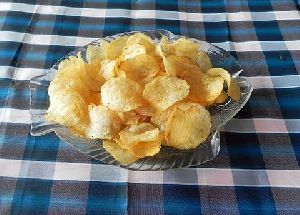 Kerala chips is very famous dish which is decorates the dinning table for all special occasions and is liked by people all over the globe. It is specially prepared with special banana and oil to make the snacks taste delicious. Kerala is God's own country. The greeneries around Kerala enhances the livelyhood of the people there. Chips are very famous in Kerala and it owns a different fresh taste than elsewhere.Different variance of Banana chips.